I was curious to know about this tea estate more closely because it holds a unique distinction of being the oldest tea estate in Darjeeling and offering a rare sense of nostalgia as it takes you back to British planters days of 1850s. Factually it was the Steinthal tea estate which was the first where Darjeeling tea plantation took place for the first time in 1852. 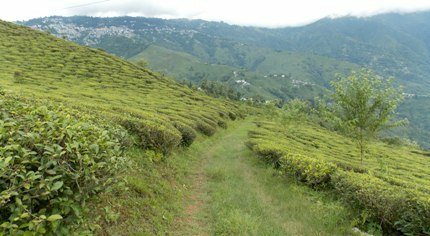 Aloobari and nearby Tukvar tea estates were the other two that came up around the same time, while Singtom Tea Estate is the third oldest garden in Darjeeling which joined the bandwagon of British tea estates few years later. But if you stay at Singtom Tea Estate & Resort, you can still see some of the surviving tea bushes of 1852 that were the first to be planted in Darjeeling hills. How? In 1999, the Chirimar family from Kolkata took over both Singtom and Steinthal, and converted them to organic gardens. Steinthal is a sister tea estate of Singtom. The 5th generation of the Chirimar family is now running these estates. The family also owned the same estates between 1952 - 1975. The two estates together span across 1662 acres of area, stretching over a vast landscape of sprawling tea gardens, natural forests, waterfalls and even a river that flows through the estate at the bottom. And all these are accessible to you as a guest of the resort. The average altitude of Singtom tea estate is about 4,500ft with a highest altitude of about 5,900ft and going all the way down to 2,100ft along the mountain slopes. It produces some of the finest organic tea - black, green and white under different brands representing different flavors and grades. There are around 850 workers out of which about 600 are engaged in plucking tea most of who are women, rest work in factory, maintenance jobs and elsewhere. The Singtom Resort and the factory are located inside the garden, separated by some 300 meters (the resort is at a lower level than the factory) and both surrounded by tea gardens in all directions. Below is an account of my experience of the garden, the resort stay, factory visit, and even tea tasting apart from several other activities within the estate. 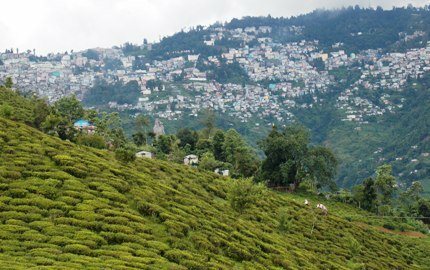 A great advantage of Singtom is its proximity to Darjeeling town yet taking you away far enough to be secluded amongst nature and tea gardens. 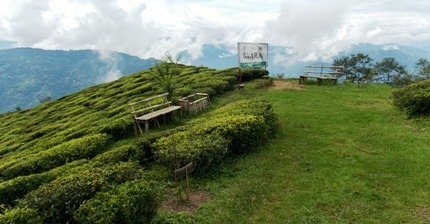 While Happy Valley Tea Estate would be closer to the town, it doesn't have any resort to stay and therefore tea garden experience can not be completed there. So Singtom is the only Tea Estate with a resort which is nearest to Darjeeling downtown (only about 25 minutes drive) while other tea resorts are couple of hours away. If you are coming directly from NJP station or Bagdogra airport, you can avail the resort transport (usually a Tata Safari, or a contracted vehicle) which can pick you up and drop you back. Alternatively you can take a private taxi. But note that the taxi drivers may not agree to take you all the way to the estate resort, because it's located outside Darjeeling town. It takes about 3 hours to reach Darjeeling township (Chowk Bazaar) from NJP/Bagdogra, and another 15 minutes to reach Singmari taxi stand located just before St. Joseph's College, North Point. If you took a taxi, this is where you need to get off. From here you need to take another taxi or a jeep, or you can pre-arrange with the resort management to send their vehicle to receive you at the stand. 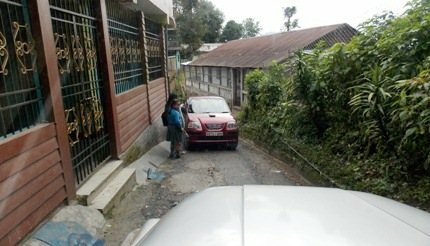 Right after the taxi stand there is a narrow steep and winding lane which leads down towards the tea estate. It's about 12 minutes drive (4kms) from the stand. The initial part of the road passes through congested residential areas, and the road condition on this stretch is quite bad. You will pass by the Singtom Cemetery and more residential areas. The road is so narrow that if a car comes from the opposite direction, you will be deadlocked until one backs off to find an open patio of a private house where the car could be tucked while the other car passes. I had to go through this experience. But let that thought not deter you. Because soon the scenario changes. 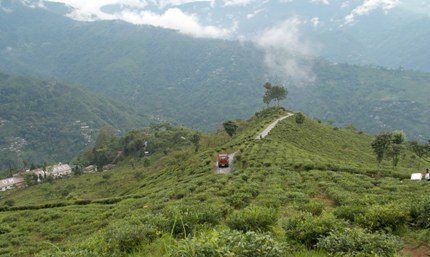 The winding road gets into the tea estate and the views of the vast rolling tea gardens on the slopes of mountains will blow your mind off. I'm sure you will ask your driver to stop to take pictures. I kept asking the resort driver Jeevan for photo stops, and he smilingly obliged. Update February 2019: A new road has now been constructed which gets rid of the hassle of driving through the old narrow road. This approach road starts from right outside North Point school. It shares the same wall as the school. Along the way the road bifurcates, the road on the left goes all the way to Singtom. It's a beautiful scenic road and a real treat to the eyes. With the new road in place (triple the width of the older one) and the old road being repaired, Singtom is now just 10 minutes away from Singmari, which makes it just 20 minutes away from the town. You will soon reach a junction, where a sign points to the factory towards left. Look left and you can see the factory few yards away. But you need to continue to go down further (some 300 meters) to reach the resort. As you enter through the gate, you see a wonderful old styled British planters bungalow nestled in a lovely garden settings. The bungalow was originally built in 1862. From anywhere in the resort you look around and you can see endless stretches of tea gardens. Sitting at the lawn, look up and you will see Darjeeling town ahead of you on top of another mountain. The glittering lights of the town look so wonderful at night. Walk around and go down to the backside patio and the garden. From here you get awesome views of Kanchenjunga snow peaks. You will soon realize that this is one place which packages almost everything of nature and human comfort, all at one place. I must say that I had a stroke of luck. The night I stayed at the resort, I was the only guest, and the entire Bungalow was available to explore and enjoy at my own fancy. Well I had a company though during the day. The Asst. Manager Naveen came running within few minutes of my reaching and introduced himself. I didn't know that he would be my host and tag along with me for rest of my stay to ensure that I had a memorable time. I must say he did his job to perfection. I came to learn that the original British planter's bungalow had to go through several renovations to get it up to the current state which not only retains the old charm, but also provides all modern amenities with classic finish. 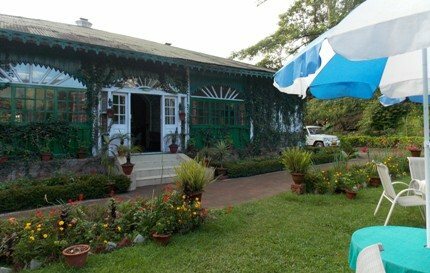 It was used as the Tea Estate Directors' bungalow until 2012, and then was opened to tourists. However after the estate owner's elder son Aditya Chirimar completed his graduation from Cornell University, he took it over and launched it as a resort in April 2014. The front porch of the bungalow was an open veranda. It has been covered and made as an extension of the lounge area. Covered porch. My tea is served. All around inside the bungalow you will find sculptures and wall paintings of Buddha which is integral to its overall decor. It reflects a touch of solemnity and spirituality. And when the darkness falls, the dimly lit lounge and the rooms with handpicked selections of matching teak furniture and custom light fittings create a true ambience of the past era. Lounge rooms and the front covered porch have wicker sofas with comfortable cushions. Sit and relax, and read a book, or just go out to the lawn, sit under a garden umbrella and let your eyes scan the nature. The fine aromatic tea is always available to order. 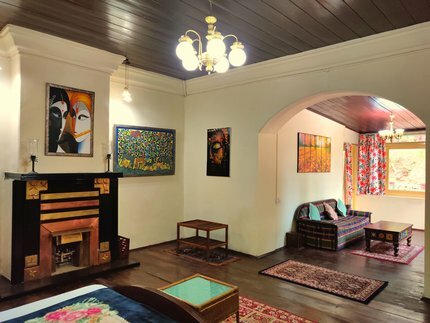 Update February 2019: They have added about 75 paintings and art panels to the interiors, to cover the rather empty walls and add a Himalayan feel. A majority of these are connected to the mountains, peaks, tea estate, the Buddha, nature, etc. The lounge and all rooms have fireplaces that have been existing since mid 1800s and are still fully operational. They are lit during winter. The lounge is the place where you can meet your fellow guests in the evenings, have a chat, learn and share your experience. Behind the lounge is the dining room. The table space is large enough to accommodate all guests at a time, and that is the whole idea. You dine together as you chat and share your findings of the day in the gardens. Behind the dining area is another small cozy sitting space. This is where you can enjoy a drink if you so like. There is a small portable cellar/bar cabinet which can be stocked if requested in advance. Common to the dining room and the bar sitting area is a large well equipped washroom. A door from the bar area leads to the backside patio and the kitchen. And this is the place from where you get spectacular view of the snow mountains. Update February 2019: The patio at the back is now fully tiled and offers a great view of the peaks. The patio also has a gazebo that enables outdoor seating in adverse weather conditions, as well as wooden picnic tables for bigger groups to sit together. Presently there are four spacious rooms. Extension work is underway at the back side and there will be few more rooms made available shortly. 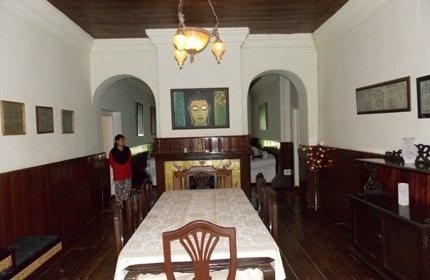 All rooms are great, finished with high wooden ceiling and teakwood floor, complete with original fireplaces, dressing tables, wooden cupboards and other furniture & fittings, retaining the aura of old colonial days. 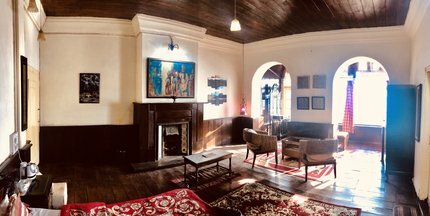 However there is one room which is special, it's the largest and the best - the Steinthal Suite named after the Steinthal tea estate. I stayed in this room. The fireplace is over 150 years old and is in full working condition. 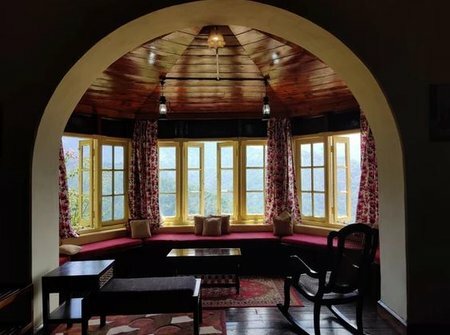 Another highlight of this room is its long curved bay windows at one end with sweeping views of tea gardens and the mountains. A morning tea sitting on the window-side cushion is a must. The suite is ideal for honeymoon couples and a romantic stay. The bathroom of Steinthal suite is also as large as a standard room. Other than a bathtub fitted with shower mixer, there is a long mirror on an wooden stand on one side. Towels, soaps, tooth paste etc are provided. The geyser is large enough to hold plenty of hot water. 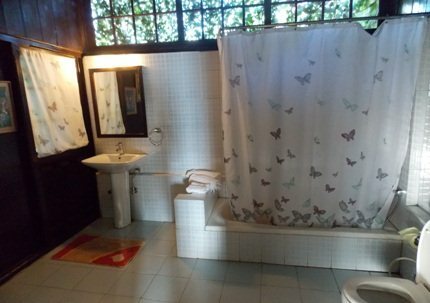 The bathroom gets plenty of natural lights through the glass windows above. 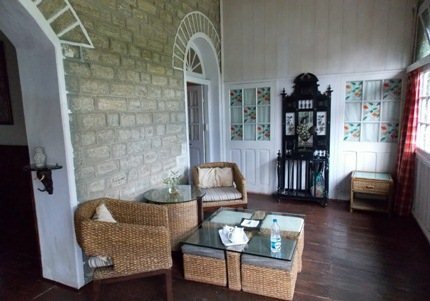 Singtom Suite is the oldest room in the resort and named after Singtom tea estate. The room Victoria's Peak is named after a brand of tea in Singtom. Those tea bushes are actually quite close to this room. 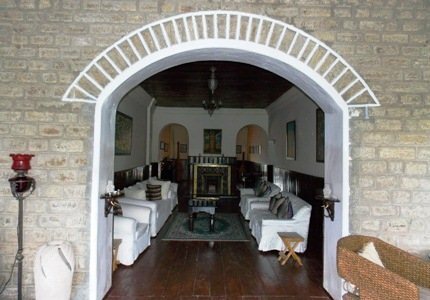 The other room is Himalayan Suite and the only one which does not have any views, although it has a window facing the backside where a storehouse has been built. I was told that this storehouse would be removed shortly. All rooms have age-old fireplaces, adequate sitting arrangements, attached large bathrooms with hot & cold showers. I noticed separate exit doors in all bathrooms leading outdoors. Perhaps this provision was made for the sweepers who had to once access the bathrooms through separate service doors and were not allowed access in the main rooms. There is no TV anywhere in the resort, neither any wi-fi. The point is, why do you have to get dragged into routine life when you have chosen to be in another world. But if you can't live without checking your emails or facebook, you can carry your laptop with a dongle. Airtel, Vodafone and BSNL 3G/2G work everywhere in the resort. I had no problems. Update February 2019: There is now a Jio device at the property, for those who need WiFi. Housekeeping is done everyday and the lady staff will make your bed and clean your rooms. They usually do it when you are away, so that when you are back you get nice clean rooms. At night a chowkidar (guard) remains posted near the entrance. He would be the person to call if you need any help during night. During the day, it's mainly one of the helper staff at the kitchen who would attend to your needs. There is a bell switch at each room which you can press to call for service. Singtom serves only fresh and organic vegetarian food. If that's putting you off for some reason, hold on. If you are not, be a vegetarian for few days during your stay here and you won't regret. The lady kitchen staff make excellent vegetarian and even vegan friendly food. 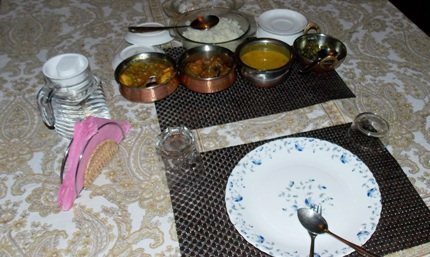 But if you must have non-vegetarian, the good news is that Darjeeling town is only about 20 minutes drive and you get plenty of non-veg options there. Breakfast is available from 7:30am to 10am. You can take it at the dining room, at the covered porch, or if the day is good, at the outside lawn under a garden umbrella. My favorite here was aloo paratha with coriander chutney. It's accompanied by fresh fruits like apples, bananas etc, and of course Darjeeling tea made with freshly plucked leaves. Update February 2019: They have done away with the original dining area and made a cafe-style dining area instead. Now, guests do not have to sit together in the dining area and so they have their privacy during meals. While this hampers the sense of community that would prevail earlier with guests having to sit together and dine, it increases the comfort level of each guest individually. Furthermore, tables can always be joined together if guests want a community-style dinner. Ladies at the kitchen serve the food with great care. Out of three of them, one is the main cook while the other two are helpers. During lunch I was served hot chapatis, rice, salaad, daal, a curry made with paneer (cottage cheese) & capsigum, couple of other veggie dishes made with bhindi (lady fingers) and beans. And for desserts they served cut mangoes and sweets. Being a small eater, I had to return several of them. Update February 2019: The menu has grossly improved and contains several more dishes (all veggie though). In Breakfast some of the items added includes beans on toast, herbal paratha, poha, kachori, rolls, momos, cutlets and more. In lunch and dinner menu, some new exotic items include Punjabi chole masala, Benarasi Kadhi (a Singtom special), Chili Paneer, Veg Manchurian etc. There are more than 40 items available for breakfast, lunch or dinner. All items are 100% vegetarian, with most items being grown at the estate, which of course is organic. They now have a signature drinks menu, with in-house beverages being served that one would typically never have had elsewhere. All the teas that they serve are now offered by their premium, artisanal tea brand Chai & Mighty. The staff will notify you when the food is ready. Usually the food would be kept on the dining table and you need to self serve. And the meals are sumptuous and more than enough. Filtered water is served in nice glass jars. You can also take packaged drinking water at extra cost. Vegetable Pakodas and tea are served in the evenings. Dinner is served by 8:30pm. Since all kitchen staff are women and local villagers, they need to get back home once you finish your dinner. They keep changing the dishes every day. They also make vegetarian Chinese dishes. As part of your stay in Singtom Resort, you must take a factory tour to see how Darjeeling tea leaves are processed and then made into finished packaged tea. They go through several delicate stages of processing including Withering, Rolling, Fermenting, Drying, Sorting and Packaging. The factory is located at a walking distance from the resort. Here is my Experience of visiting Singtom factory. Tea tasting at Singtom is an experience by itself. If you haven't done it before, yo must do it here because you will not only get the opportunity of tasting a range of finest tea of the gardens here which have been commanding heavy price in oversea market for long, but you will taste it the way the expert tea tasters do it to determine the flavor and grade of the tea leaves. Check out my Experience of tea tasting at Singtom. It's always a lovely sight to see women plucking tea. During monsoon or summer you will find the women using umbrellas as they pluck and shield themselves against the sun or rain. Note that plucking doesn't take place in the winter from December to February, and this is when the factory also does not process tea. The resort offers tea plucking tours accompanied by a manager. While the manager will guide you through the tour, you can get to understand the delicate process of tea plucking from an expert garden worker. Tea leave plucking is a special art and women are found to be more efficient and consistent than men. Most garden workers are Nepali women. Although in many different places in the world, machines are used nowadays to pluck tea because of rising labor cost, in Darjeeling it's all done in natural way by hand. Only the shoots with two leaves and a bud can be plucked. Naveen, the Asst. Manager mentioned that an average daily target of 3 to 4kg is given to each garden worker plucking tea leaves. And on high production season, one would have to pluck almost double the normal target (i.e. about 7 to 8kgs of tea leaves). You can imagine how arduous the task is. If one doesn't meet the target, one's daily wage could be adjusted. Similarly, incentives are given to those who over achieve the targets. I have been fond of trekking since I was very young. But trekking through the tea gardens that too the oldest one in this part of the country and dating back to the early colonial days, spanning along the slopes of the mountains with snow peaks at the backdrop and landscapes full of tea bushes, jungles, waterfalls... is something very special. There are four trekking trails that wind around the slopes of the hills and each offers walks through vast stretches of tea bushes, forested lands and sights of flora & fauna, lovely waterfalls and Kanchenjunga snow peaks. The four tracks together offer a total trekking distance of about 22kms. However my favorite is to descend down the winding village pathway (of about 8kms) leading all the way down to Rungeet river at the bottom of the estate. The river below flows over a rocky bed and in a beautiful setting of a valley. There is a hanging bridge here which is more that 100 years old connecting the two banks of the river. It's a great place to be with the nature, sit on a rock and splash your feet in the water. If you are too tired to walk all the way back to the resort, they can send a car up to a point to take you back. On my next visit, I shall ask the resort management to organize a campsite by the river side. That experience would be simply awesome. Another must visit place in the estate is the 360 degree view point. 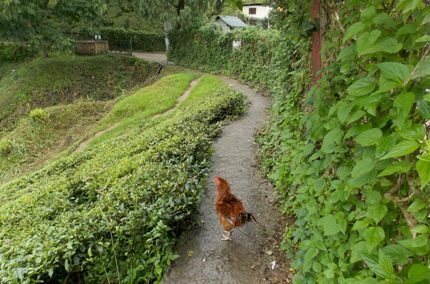 It's located at a higher elevation and you can take a resort vehicle up to a point and then walk uphill through the tea gardens for about 200 yards or so to reach the place. As the name suggests, you get 360 degree view from here. On one side are the majestic Kanchenjunga snow peaks and on the other side is the Darjeeling township ... an awesome view and a lifetime experience. But the best part is, the resort can arrange for your breakfast or lunch here under an umbrella. The staff will carry the chairs, table and the umbrella right up to the top. Spend some time here reading books and soaking in the views. I haven't seen such setting anywhere. Darjeeling main town is only about 20 minutes drive from Singtom resort although the nearest township at Singmari is only about 10 minutes. You can take the resort vehicle to visit the main attractions in Darjeeling or go for shopping or dine at one of the great restaurants. Vehicle usage is at additional cost unless you take all-inclusive package. Once the village road winding past the resort went through where a part of the lawn is. The owners have moved the road away and widened the lawn. The extended garden area now has a badminton court and also a putting green for golfers. Just aks the resort staff and they will provide you the racquets, shuttles etc. The serene and the tranquil atmosphere in the resort would certainly trigger your sense of spirituality. And you would wish if there was a chance to do yoga by the riverside, the waterfall or at the 360 degree point. It's actually possible! Notify the resort management at least 2 weeks in advance, and they can send a yoga teacher from Kolkata at an additional cost. Minimum 3 nights stay is required for yoga sessions. Update February 2019: The lawn has 2 wooden picnic tables, and a gazebo. These have been added in order to create different seating arrangement for different types of guests in different weather conditions. They have added a high-tech massage machine that guests can use on a complimentary basis. There is a small soccer field located right below the resort. It's only about some 100 steps away from the gate. You can go down and play football with the locals. They are all from the nearby local villages that are part of the estate and will welcome you to play with them. 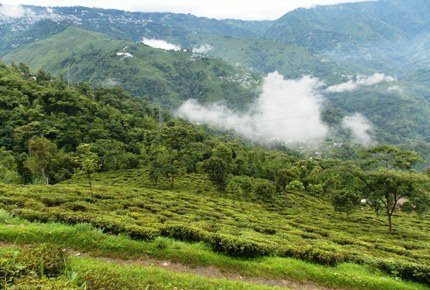 The adjacent sister tea estate Steinthal has been named after Father Steinthal, a German priest who was the first to initiate plantations in some sections of the garden which is the oldest in Darjeeling hills, dating back to 1852. The seeds were first raised in government nurseries and then planted in this garden. Large areas of the forests had to be cleared on the mountain slope to make provision for the tea garden. There are 14 villages in Singtom-Steinthal estate each with a different name. One such village is 'Dhanman Dhura' which is located quite close to the resort. By the way 'dhura' in Nepali means 'village'. The management seems to take good care of the estate workers. As per norms set by Tea Planters' Association, all workers work on daily wages and get paid fortnightly. Other than daily wages, all workers are given provident fund, gratuity, offered free housing (however they need to pay for electricity), there is a school inside the garden for the workers' children, crèche facility for women so that they can go for work leaving their children at the crèche, basic medical facilities, firewood, umbrellas, as well as ration at low prices. Rs. 7000 per night for our Suite (there are two), Rs. 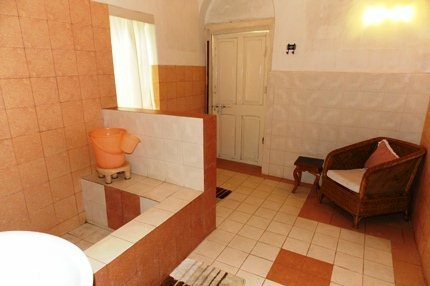 7500 per night for the Suite with Mountain View (there is one such suite), and Rs. 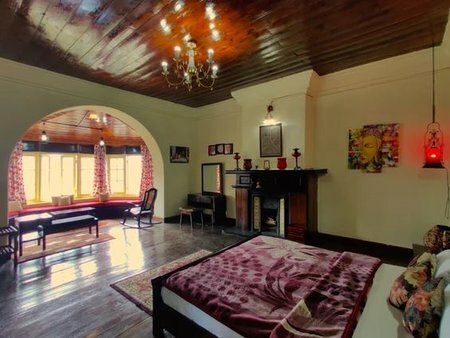 8000 per night for our King Suite with Mountain View (there is one such suite). Prices include taxes, accommodation, WiFi, tea from their premium tea menu, afternoon snacks. Everything else is chargeable. Breakfast costs Rs. 500 per head, while lunch/dinner cost Rs. 600 per head. Airport transfers cost Rs. 3500 per car for regular cars and Rs. 4000 per car for premium cars. The cost of tours is Rs. 1500 per person for the factory tour (becomes Rs. 750 during the winters), Rs. 1000 per person for the tasting, Rs. 500 per person for the plucking and Rs. 500 per person for the trekking. The factory and tasting tours is given by our resident tea expert instead of the assistant manager. 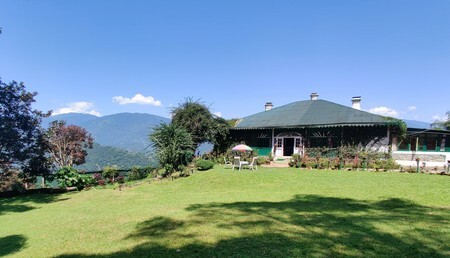 1) Singtom offers a great mid priced and affordable tea resort stay which is rare in Darjeeling. 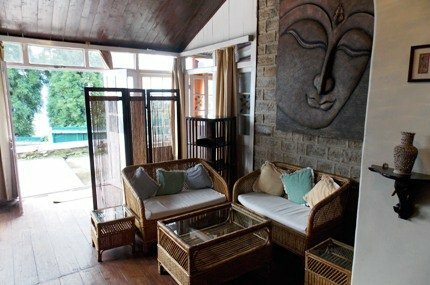 I have visited and stayed at many tea resorts in Darjeeling hills, but almost all are grossly overpriced, meant for high-end sections of the society or NRIs, and making them beyond the reach of average man. But Singtom nicely bridges that gap and makes a luxury tea retreat stay affordable for many which was not possible a few years back. 2) This is the oldest tea estate and resort of Darjeeling hills which reflects a very special aura of old times. The furniture, fittings and decorative items have all been carefully handpicked to blend with its heritage. You will feel that time has come to a standstill and taking you back by centuries. It ads a special dimension to your tea garden experience. 3) Yet it is so close to Darjeeling town that you get best of both the worlds. The nearest township at Singmari is only 12 minutes while the main Darjeeling town is hardly 25 minutes drive. If you didn't want to miss out on shopping or numerous restaurants & bars, take the resort vehicle for an easy drop. 4) I have seen many tea gardens, this one is in my list of three most prettiest ones. Where else can you get to see the majestic snow peaks of Kanchenjunga, the sparkling lights of Darjeeling town, forests full of wide range of flora & fauna, river stream, waterfall and of course endless stretch of lush organic tea gardens all in one place? 5) I must say that the resort staff too are special. They bear the rustic village charm at the same time are well trained, very polite and ready for service anytime with a smile. Hailing from local villages, they blend so nicely with the overall natural atmosphere. A garden manager will be there to bridge any language gap as the staff and garden workers do not speak English. However they do speak and understand Hindi and of course their native language Nepali. 6) I liked the fresh organic vegetarian food served and the quality of preparations. There will be rice, chapatis, salad, daal and three other vegetables with dessert which I think is more than enough for anybody. 7) Overall it's a great place for a romantic getaway or a relaxing family vacation amidst nature and tea gardens. 1) I have noticed that extensions are taking place at the backside of the resort to increase room capacity. I hope it does not become too commercially oriented and start intruding into the tranquility and peace of the place which is its main strength. After all the nature lovers want space and privacy, and this is crucial especially for tea tourism. 2) Lights in the resort have been kept dim purposely to create the aura of old heritage bungalow, which is excellent. However some provisions (like personal drawable lights in the lounge) or in the rooms can be arranged so that one can read books in the evenings without interfering with overall lighting level. Update March 2017: The new scenic road has solved this problem. 3) Although it might be a stray case, I found the water pressure in the bathroom a bit low and would have liked a more comfortable shower. Perhaps the water level in the tank came down on the day. Hot water was adequate though. 4) The cupboard in the room was quite large and spacious. But a part of the cupboard was filled with items perhaps used by owners' families. That part should be kept locked if such items must be kept there. 5) Approach road from Singmari stand to the estate is quite bad at patches. I know much part of it does not belong to the tea estate management, but I guess they can work more closely with the municipality to keep it well maintained. The extensions that were taking place at the back of the bungalow have been completed. No rooms will be added to this area. All new rooms will be added slightly away from the main bungalow so as to maintain the charm of the main bungalow as well as to ensure that the tranquil atmosphere is preserved. They have improved the brightness of the lights by adding several LED lights and also increasing voltage of the resort as a whole. They have increased the water pressure in all bathrooms and also the volume of each geyser. Luxury toiletries have been added to each bathroom. The toiletries are now all infused with White Tea grown at the estate. Any cupboard in a room that stored the owner's personal items has now been locked. Singtom also produces oolong teas now. The owners have added premium SUVs (Tata Hexas) instead of the regular Safari/Sumo that they used earlier. Most (50%+) of our property is now carpeted, because the designs on the carpet add to the premium feel of the place. They have added sign boards all over the plantation for resort guests. Now, when you enter the plantation, you will see a sign board saying "Factory" and "Resort" and pointing in the correct direction. They have painted the roof, which was looking a little run down. There is now a full-time hospitality management team, comprising of a hospitality manager who is well-dressed and speaking good English. This was required because more than 50% of the guests here are foreigners. They also have a part-time tourism manager who is present during the peak season. The tourism manager accompanies guests for trips in and around Darjeeling, as well as for airport transfers. This ensures that the hospitality starts right at Bagdogra Airport and continues all the way up to Bagdogra Airport. They have added a library with about 50 books on Darjeeling, tea, local culture, books for kids, travel, sports, movies, etc. They have added an exquisite tea menu. Tea is now served in champagne glass, in keeping with the famous tag line "Darjeeling is the Champagne of Tea". They have added an elaborate dining menu. This was a major problem earlier. Now, guests have clear directions on what is available. They have added a bonfire in the lawn, near the badminton court. The bonfire area is used to have a cup of tea by the fire or a glass of wine. They have added about 12 lights in the lawn, so that it can be well lit at night. As a result, guests now use the lawn as a venue for dinner and drinks as well. They have upgraded the quality of bed sheets, bed covers, carpets, mats, mattresses, etc. They have converted the previous bar area into the dining room, and the previous dining room area into a second living room. This has been a welcome change for the guests, now they have a bigger lounge area. There is now an in-room tea service option. They serve teas produced under their own brand 'Devaacha'. These are the same teas as the ones they supply to the Taj Group. They started supplying teas to the Taj Group in 2015 and they offer the same teas at Singtom Resort now. They have added lighting to each bathroom. Now, there are 3 lights in each bathroom, as compared to 2 lights earlier. Guests now have access to Wi-Fi. Breakfast is now available any time after 7 AM. Dinner is now served from 6-9.30 PM. 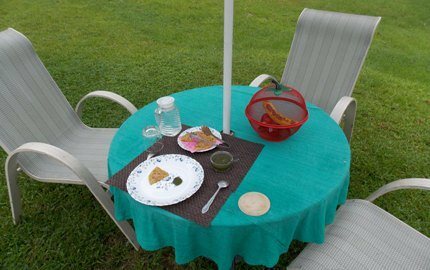 The 360 Degree Point Visit now includes the option to either have your picnic on tables and chairs (as you did) or to do it in a more relaxing way using yoga mats on which you can lie down and truly enjoy the beautiful surroundings. They have replaced the old badminton rackets with 4 new ones. They have added Monopoly, Uno, Cards and Scrabble for guests to play. From Bagdogra airport or NJP station, you will first need to come up to Darjeeling lower town (known as Chowk Bazaar) and continue along Lebong Cart Road for 15 minutes to reach Singmari taxi stand. From there it's another 4kms and takes about 12 minutes - a steep narrow downhill lane leads to Singtom tea estate and the resort. The total one way trip duration would be about 3 hours+ from NJP or Bagdogra in normal traffic conditions. Kolkata: 700016, West Bengal, India.